Antonio Conte’s difficult second season at Chelsea took another turn for the worse with this damaging home defeat by Tottenham Hotspur. Despite taking a deserved lead through Alvaro Morata on the half-hour mark, the Blues weren’t able to hold the advantage through to half-time; Christian Eriksen’s piledriver in added time brought Mauricio Pochettino’s side level, before a second-half double from the supposedly out-of-form Dele Alli secured all three points for the visitors. A first Spurs win at Stamford Bridge since 1990 also saw a return from injury for Harry Kane, as the north London side joined Manchester United and Liverpool in strengthening their grip on a top-four finish. For Chelsea, and indeed Conte, fifth place is not good enough. Antonio Conte’s side started in a 3-4-3 formation, dropping back to a 5-4-1 in defence. The Italian switched to a 4-4-2 for the last 10 minutes with his side already 3-1 down, replacing Victor Moses with Olivier Giroud. The Blues worked to press the player in possession hard throughout, with N’Golo Kante showing his usual tenacity in closing down the opposition midfielders. They tried to stop Tottenham from passing the ball around in midfield by constantly pressing their opponents and blocking possible passes through their defensive unit. 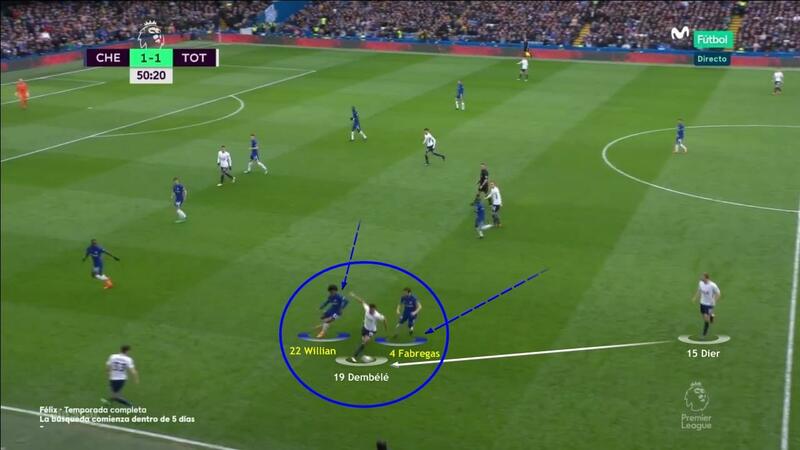 As time went on, however, spaces began to emerge in the Chelsea defence, and Tottenham were able to exploit the gaps with breakaway runs such as that Dele Alli made for his first goal. The home side were also guilty of weak marking on the edge of their own penalty area – a failing that allowed Christian Eriksen to unleash the shot with which Tottenham equalised – while they also struggled with the overlapping runs of Spurs full-backs Ben Davies and Kieran Trippier. In their defensive transition, Kante was typically important. 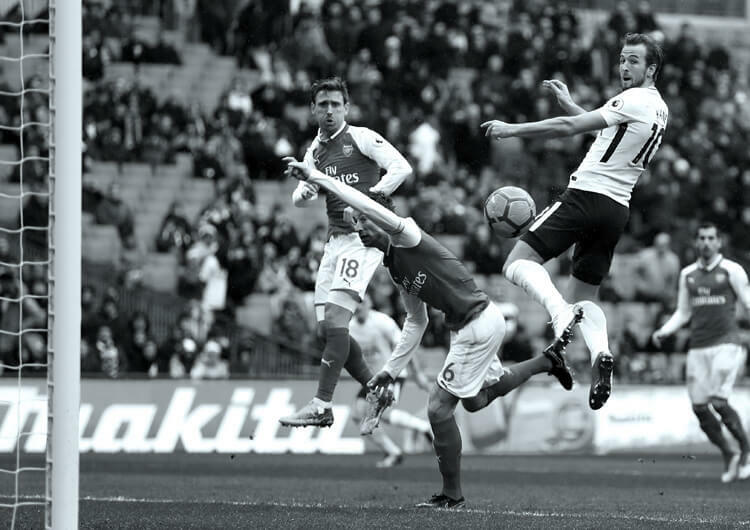 The holding player brought balance to the midfield as well as covering any gaps in the defence as they tried to reorganise in the face of a quick and dangerous Spurs front line. 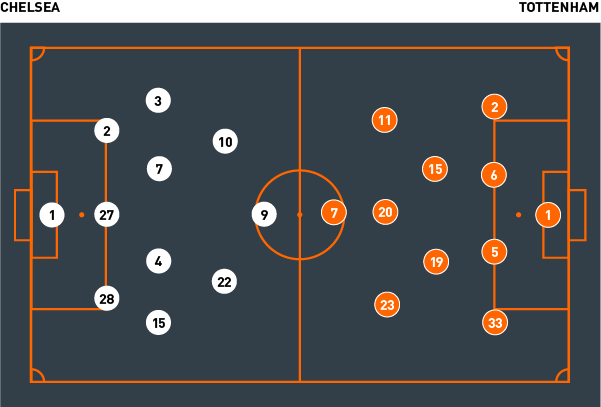 As a rule, if their front line failed to win the ball back or cut short the counter-attack, they tried to hold up the opposition by getting defenders behind the ball as quickly as possible. 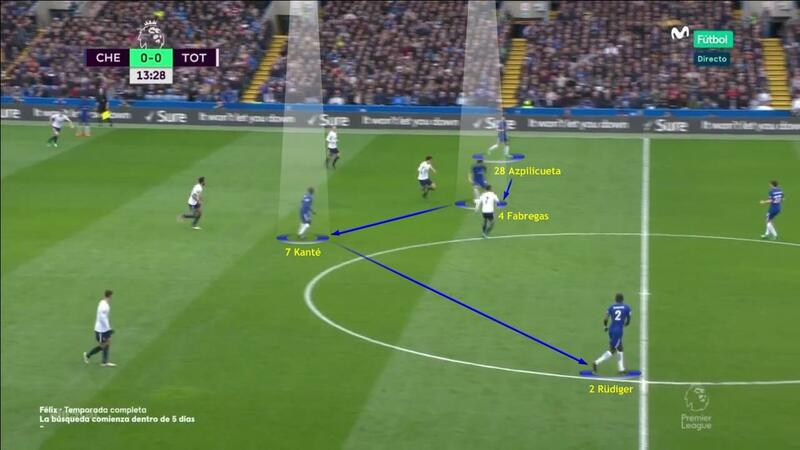 Chelsea’s first choice in attack was combination play, as they tried to build from the back. 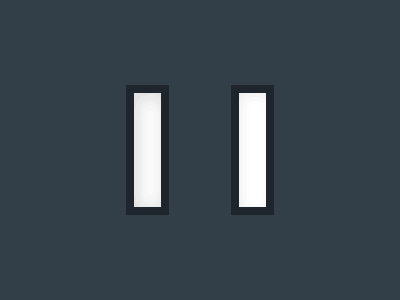 They notably found it difficult to play direct, a tactic they often employ so successfully. Instead, they looked to shift the ball around in midfield, where they had some success in swapping between direct passes into space and individual runs to give continuity to their play. This often started with Kante, but also saw Eden Hazard and Willian dropping deep to offer support and help develop play. 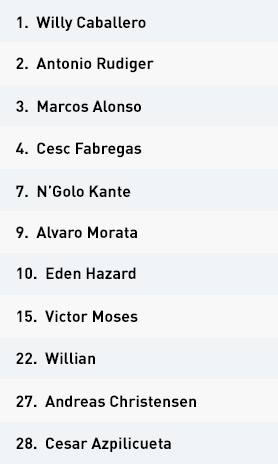 As ever, the home side relied to a certain degree on the attacking intent of their wing-backs, with Marcos Alonso and Victor Moses typically offensive in their outlook. 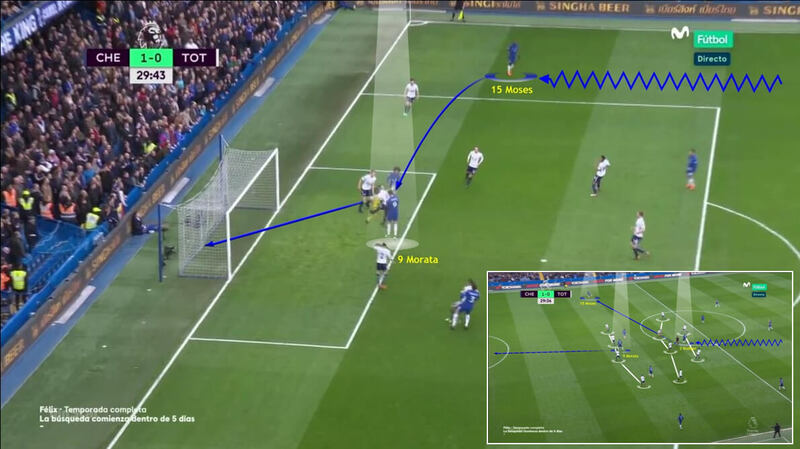 Their overlapping runs and desire to get balls in from wide areas were a central part of Chelsea’s attacking approach, with a cross from Moses leading to the Alvaro Morata header that put them 1-0 up after half an hour. Hazard, Willian and the rampaging Alonso never stopped looking to make the most of any spaces left by the Spurs defence, but beyond his goal Morata was largely ineffective and Conte’s changes – both in terms of system and personnel – came too late to have any real impact. 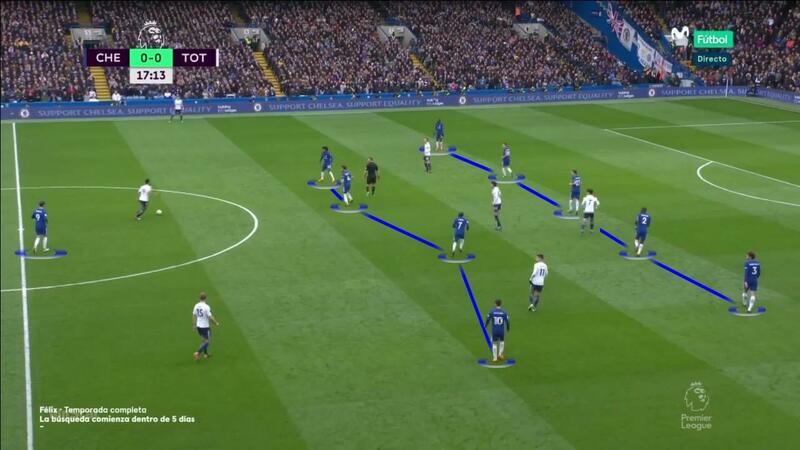 Chelsea started in a 3-4-3, dropping back into the 5-4-1 shown here in defence. With Chelsea already 3-1 down, Antonio Conte switched to a 4-4-2 for the last 10 minutes, replacing Victor Moses with Olivier Giroud. 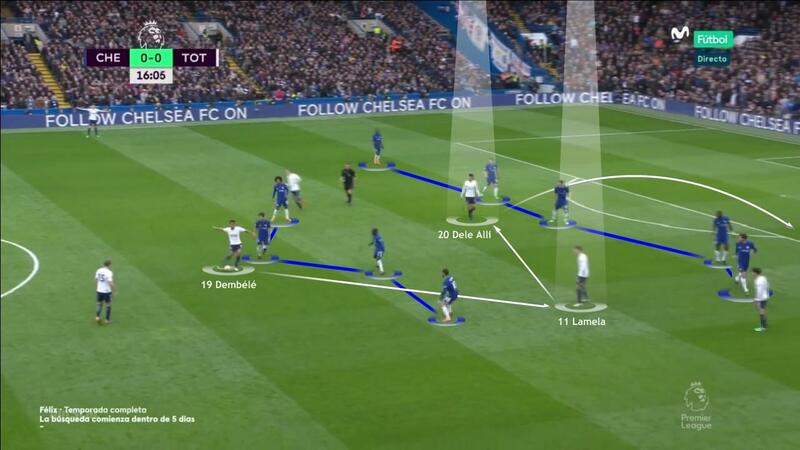 Chelsea tried to stop Tottenham from passing the ball around in midfield by constantly pressing their opponents and blocking potential passes through their defensive unit. Here, Willian and Cesc Fabregas work to pressurise Mousa Dembele as he receives a pass from Eric Dier. The Blues midfielders showed good judgement in swapping between direct passes into space and individual runs to give continuity to their play. N’Golo Kante, here taking possession from Fabregas before finding Antonio Rudiger in space, stood out in this regard. 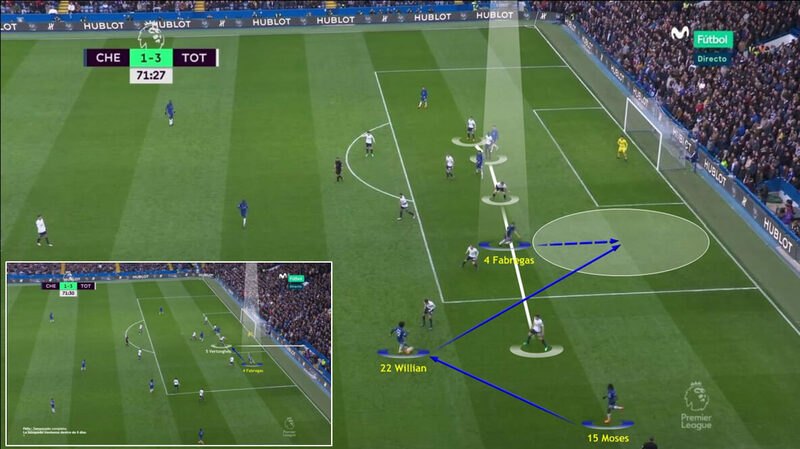 Chelsea found it difficult to break Spurs down through the middle, but they were able to find space in attacking areas from wide positions – as here, where Moses and Willian combine to find Fabregas in the Tottenham box. The width and attacking intent of the Blues wing-backs stood out in the final third. The overlapping runs of Moses and Marcos Alonso were the major source of crosses – not least this one from the former, which saw Alvaro Morata head the home side in front. 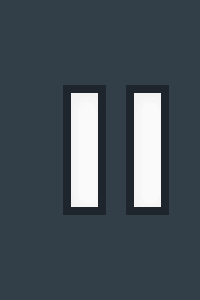 Tottenham adopted a 4-2-3-1 in attack and the 4-4-2 shown here in defence. Mauricio Pochettino changed to a 4-3-3 for the final few minutes, as Mohamed Sissoko replaced Erik Lamela and joined Dembele and Victor Wanyama in a midfield three. The Spurs front line of Son Heung-min, Dele Alli and occasionally Christian Eriksen or Lamela pressed the first line of potential receivers in a bid to try and force Chelsea to go long from goalkeeper Willy Caballero. Despite the dynamism of their attacking players in the front two-thirds, dropping back into midfield where necessary to outnumber the hosts and win the ball in promising positions, Tottenham still found it difficult to break through the Chelsea back three in the early stages. 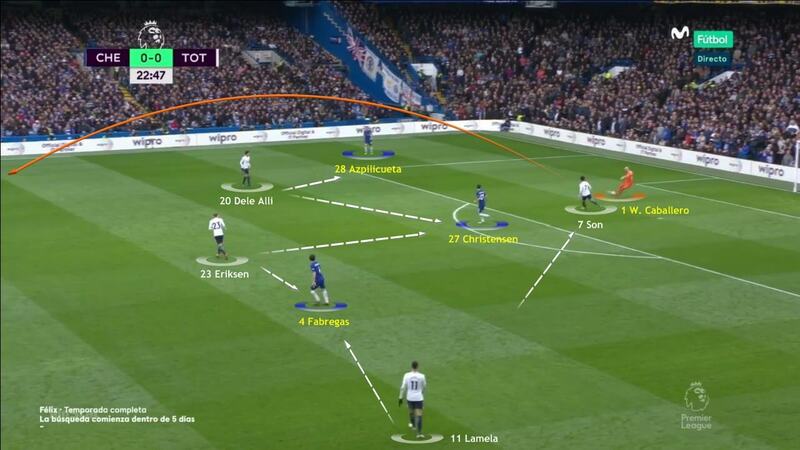 Spurs opted to vary their attacking approach due to a cautious Chelsea defence sitting deep inside their comfort zone. Instead, they picked up on the weak marking on the edge of the penalty area to attempt long-range shots, as shown perfectly in Eriksen’s superb equaliser. As the game progressed, and especially in the second half, the visitors exploited the space in between the lines and in behind the back three to threaten the Chelsea goal from breakaway runs. 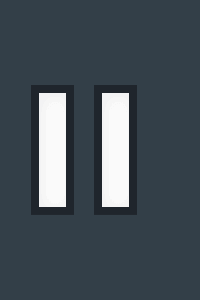 Their second goal, scored by Alli after a pass from Dier, is the perfect example. Mauricio Pochettino’s team adopted a 4-2-3-1 formation in attack and a 4-4-2 in defence. 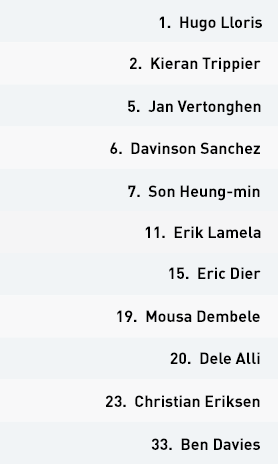 The Spurs front line of Son Heung-min, Dele Alli and sometimes Christian Eriksen or Erik Lamela pressed high and tried to force Chelsea into playing it long from the back. Their defensive line remained rigid in front of their own penalty area, conscious of the danger of the Blues attackers, with centre-backs Jan Vertonghen and Davinson Sanchez standing particularly firm and largely dominant in the air.  They did encounter problems in wide areas, however, where the Chelsea wing-backs were notably effective – it was from a Victor Moses cross for Alvaro Morata that Spurs fell behind. In possession, the visitors always looked to build from the back. Goalkeeper Hugo Lloris and his two centre-backs always looked for Eric Dier and Mousa Dembele in front of them, with the central midfield duo charged with developing their forward progression and working with the three attacking midfielders in front of them to create numerical and positional superiority in the Chelsea half. All three were capable of finding space at times, although the most effective of them in this phase was Eriksen, who constantly drifted from the left into central areas to help the link with Son up front. Despite the dynamism of their attacking players in the front two-thirds of the pitch, dropping back into midfield where necessary to outnumber the hosts and win the ball in promising positions, Spurs still found it difficult to break through a cautious and resolute Chelsea back three. 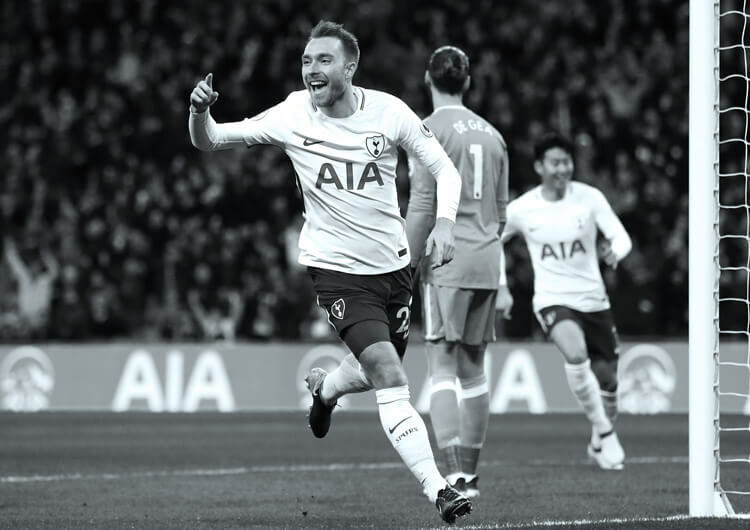 They opted to vary their attacking approach, however, and to good effect – Eriksen taking advantage of the hosts’ poor marking and depth on the edge of their area to hammer home the equaliser on the stroke of half-time. 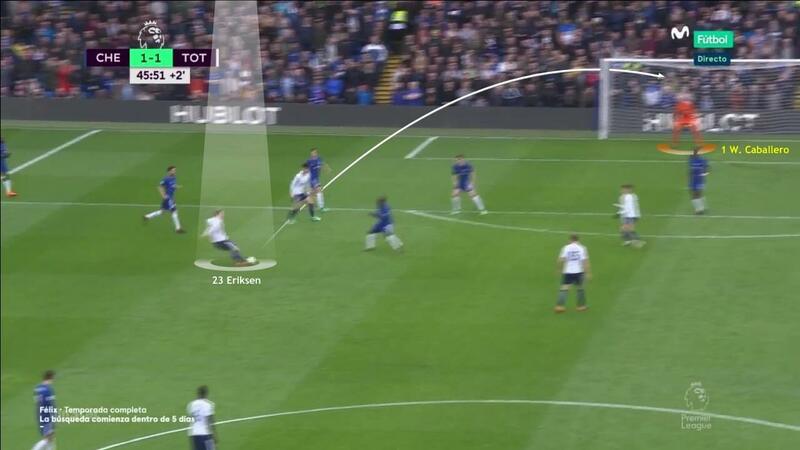 As the game progressed, and especially in the second half, Spurs exploited the space in between the lines and in behind the back three to threaten the Chelsea goal from breakaway runs. Their second goal, scored by Alli after a pass from Dier, was the obvious example. They were also constantly looking to play the ball out wide to encourage crosses into the box. Both Ben Davies and Kieran Trippier found space running in behind their offensively minded opposite numbers, Marcos Alonso and Moses, on a number of occasions. Mauricio Pochettino’s game plan made life difficult for Chelsea in attack. Tottenham blocked their path in the middle of the park and forced the hosts to adopt a more measured approach. Centre-backs Jan Vertonghen and Davinson Sanchez produced assured displays. Chelsea’s wing-backs, Victor Moses and Marcos Alonso, were able to inflict some damage on Spurs going forward. Their opposite numbers, Ben Davies and Kieran Trippier, were equally as attacking and so left plenty of space in behind them on the flanks. Dele Alli, supposedly struggling for form this season, performed fantastically well for the visitors in the attacking third. 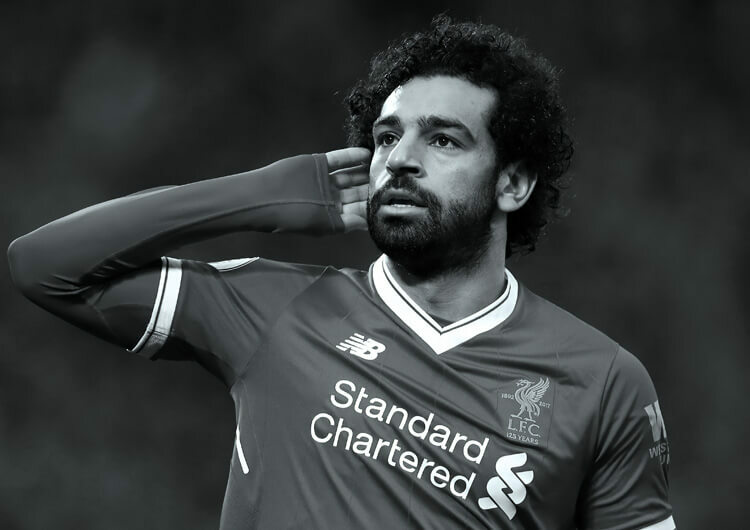 He scored the two goals that secured three points – and a very rare win at Stamford Bridge – for his team. With Chelsea chasing the game at 3-1 down, Antonio Conte brought on a second striker in Olivier Giroud and moved to four at the back. This change of system, alongside a change in personnel, came too late for the hosts to improve their performance.